you will find books of every shape and kind. And for this month, if you're local, at the Aspen Hill library you can find a display of the kinds of goods I make...more importantly, the kinds of things I teach other people to be able to make themselves. 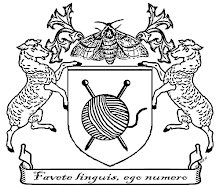 And better yet, if you're local, or if you're involved in a fiber festival anywhere on the East Coast of the US, remember that I'd love to be involved in teaching you or your attendees spinning, knitting, or weaving skills. I'd like to take a supported spindle class from you at some point. Eventually I may want to learn weaving but I don't have a loom or know what I want. Since I'm just down the road it should be easy to work out a time. Just let me know anytime. There is little I like better than teaching spinning!